Eclipse has engineered sealing solutions for a plethora of applications all over the planet. From the bottom of the ocean to orbiting the earth, Eclipse is challenged by the unique conditions of each application. Whether it be extreme temperature and pressure or severely caustic or abrasive media, Eclipse has a solution for most every sealing problem. However, one distinct environment presents a particularly challenging set of circumstances for seal design — high radiation. Eclipse’s primary seal material choice for many applications is PTFE and PTFE blends. But with all the wonderful attributes PTFE possesses as a seal material, radiation resistance is not one. In high radiation environments, PTFE’s properties can degrade, ruling it out as a suitable material. The options for effective sealing materials that are also radiation resistant becomes very limited. 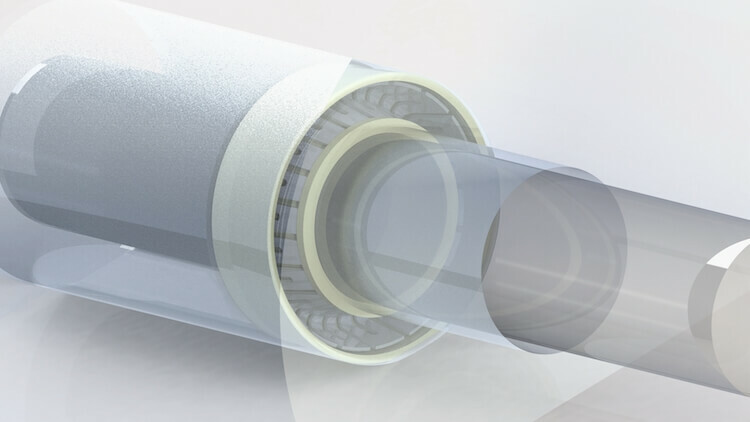 We are therefore confronted with creating a seal that is expected to perform in every way a typical PTFE seal operates, but out of materials that are not as favorable to sealing. This is where Eclipse’s engineering experience and expertise in seal design come to the forefront. Eclipse was approached by a customer that was looking for a seal solution for a sensor used in a nuclear application. It would be operating in an environment with both high temperature and high Gamma radiation. Aside from the radiation exposure, this would be a relatively mundane sealing application for one of Eclipse’s PTFE Spring Energized Seals. But that level of radiation quickly eliminates PTFE as a suitable seal material, and greatly complicates the seal design. PTFE has many benefits as a seal material. It’s noted for its low friction, high temperature, and chemical resistance. At Eclipse, PTFE-based seals are our primary business, whether it be O-Ring or Spring Energized Seals. Despite the many advantages of PTFE, it unfortunately can’t be utilized in high radiation environments. When compared to other common plastics, PTFE is actually the one most susceptible to radiation degradation. Radiation has an embrittlement effect on PTFE. Exposure degrades PTFE’s tensile strength and elongation properties. High levels of radiation and long exposure time can even cause PTFE to crumble and ultimately be reduced to a powder. Tensile strength and elongation (which dictate a material’s flex characteristics) are some of the the most important properties when considering a material for a seal. The threshold for radiation damage of PTFE is 2 to 7 X 104 rads. Depending on exposure time, dosages above this level will likely compromise PTFE’s tensile and flex properties. It’s important to note that in a vacuum, the damage threshold is about ten times higher. Therefore in space applications, such as in orbiting satellites, PTFE might still be an effective seal material against normal space radiation. In the case of UV radiation, PTFE is very resistant. PTFE won’t degrade or age in longterm sun exposure situations. But with this application operating in gamma radiation at 100 times the acceptable limit for PTFE, an alternative material would be necessary. This is where Eclipse’s advanced knowledge of seal design and material characteristics comes in. When PTFE can’t be used as a seal material due to radiation, two materials are often considered first: ETFE and FEP. ETFE, which has many of the same properties of PTFE in terms of sealing, is typically the preferred gamma radiation resistant seal material. It can withstand levels up to 107 rads. But unfortunately for this particular application, the upper operating temperature of 450°F ruled out the use of ETFE, which is typically rated only to 300°F. It’s worth mentioning that ETFE’s market availability can be much more limited than common PTFE, and can be much more costly. For very large seal sizes, ETFE can potentially be cost prohibitive as a material. FEP can act very similar to PTFE in terms of sealing qualities but withstand radiation levels 10 to 100 times greater. While this would get us into the needed range for resistance, the customer was uncomfortable with no safety factor or security margin. Plus, the operating temperature again would be at or over FEP’s normal stated maximum. With both common high radiation seal materials ruled out, Eclipse turned to a familiar but rather unconventional seal material — PEEK. PEEK possesses one of the highest radiation resistances out of all commonly available plastics. It can withstand exposure in the range of 109 rads before any property deterioration occurs. PEEK can also successfully operate at temperatures up to 500°F. Second only to PTFE, PEEK is frequently being turned to in Eclipse’s in-house machine shop. PEEK is typically used for back-up rings, bearings, and structural seal components such as seal carriers and valve blocks. But unfortunately, the material properties that make PEEK great for products needing high strength also hurt it for use as a seal material. PEEK is considered a “high modulus” material; the percent elongation before break for virgin PEEK is only 25%, and hardness is 85D. Virgin PTFE, by comparison, has 400% elongation with a hardness of 55D. Obviously, a material that is softer and can flex freely would be more desirable as a seal. The more a material can conform to the sealing surface, the better the resulting seal will be. Eclipse’s challenge was to create a spring energized seal jacket out of PEEK that could still flex and compile enough to generate an effective seal. This was accomplished by carefully controlling the lip thickness of the jacket and precisely defining the hinge point. 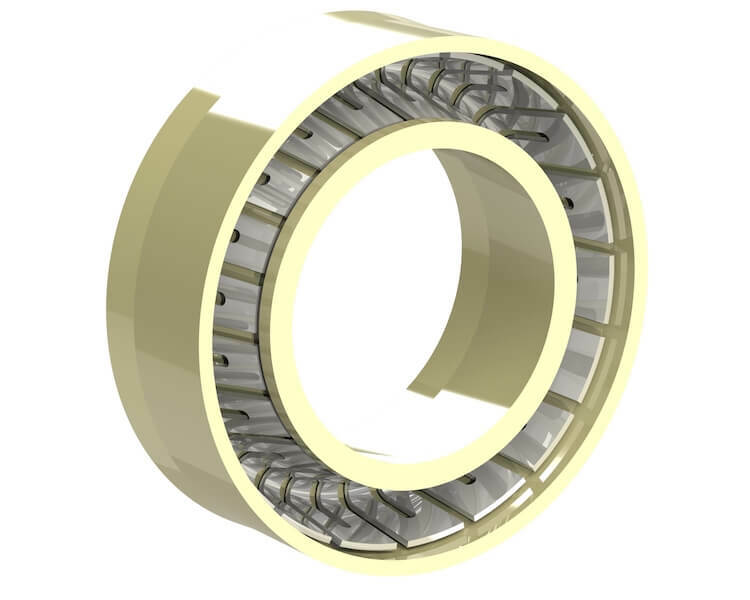 A very thin sealing lip would easily flex, but this would also compromise wear life and pressure handling ability, especially at elevated temperature. On the other hand, a sealing lip that was too thick would not allow the spring to function properly or provide energy in the correct area. Eclipse’s experienced design engineers constructed the perfect balance of flexible lip thickness and robust design. Comparatively speaking, the resultant lip thickness was very thin when sized against a typical PTFE lip design. At only about 0.012” thick, Eclipse’s precision machining ability also came into play to ensure the necessary tight tolerances were met. Eclipse chose its EP033: Virgin Grade PEEK for this application. Any material fillers would further degrade PEEK’s elongation properties. Eclipse also upgraded the cantilever V-Spring material to Elgiloy® for improved performance in the stiff jacket, as well as greater corrosion resistance. The customer was pleased to know they could count on an effective seal at even their worst-case radiation levels. 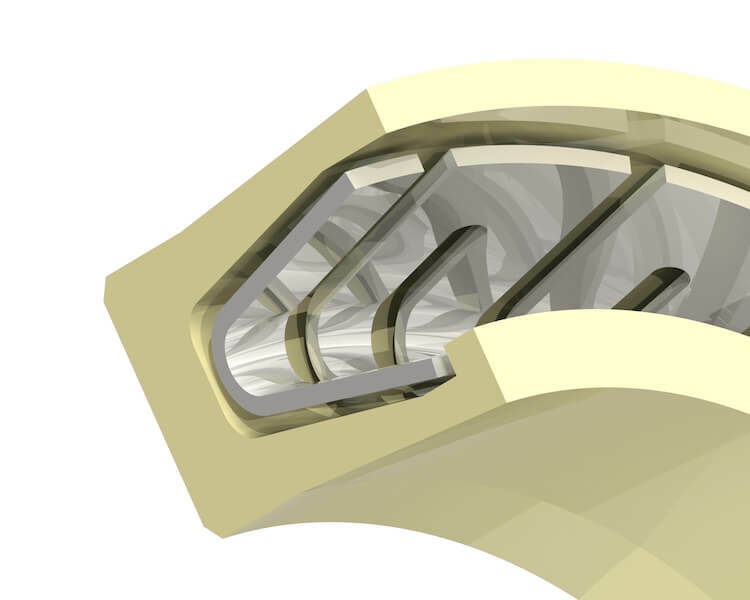 Eclipse’s detailed design and precision machining resulted in a successful sealing solution from the most radiation resistant materials available. Contact Eclipse today if your high radiation environment is causing sealing problems or you’re in the market for a new design.